A few weeks ago Amazon introduced Identity and Access Management (IAM) Service. It is a new exciting service that allows creating user accounts inside the master account and grant those account a set of permissions. CloudBerry Explorer PRO 2.4 already comes with full support for IAM service and you can learn more about that in our previous blog post. This is exactly the functionality I need. However, when I follow the directions and set this up, I am able to open the bucket, but not open, create, or delete any objects inside the bucket. Does this integrate with ACL's at all? Andy, I had this same problem. I added /* at the end and now I get the alert, "Access desnied. You can try a Requester Pays call to this bucket. Note: YOU WILL PAY for your data transfers and request costs. Do you want to proceed?". Pressing 'Yes' kicks me out. Pressing 'No' just repeats the alert. the blog post is updated. You have to create an extra statement for a bucket itself. Thank you Skyler for the heads up! I know this works, but it's tedious. Can't you reduce this to a one button click action or wizard? I'm creating an extra policy for the bucket but it's asking for the user's canonical ID - where do I get that for the 'user' account I just set up? The only way to know the canonical ID is to go to the AWS webpage at http://aws-portal.amazon.com/gp/aws/developer/account/index.html?action=access-key, enter email & password for that Amazon account. If it is an Amazon S3 account, you have to ask that user to tell you their canonical ID. Or you can get it from "Owner ID" if he has access to that Amazon S3 account and see properties of any of their files using CloudBerry Explorer properties tab. Look for the Owner ID property. I was wondering what purpose the path has in this context. I've been setting up a IAM user for SQS and S3 with group policies. What does the path refer to? Not a bucket, I assume? I feel like I'm SO CLOSE! Everything is working properly for my newly created user in Cloudberry; all buckets visible and accessible, so I went to sign in as my user in Amazon to make sure they will be able to see content. I was able to sign in, however when I went to the S3 tab in the AWS management console,I got the message: "You don't have permissions to use the Amazon s3 console. If you need assistance, contact your system administrator." What am I missing here? If I sign in as myself (primary account), I have no problems. How to log in to AWS Console with IAM accounts. Does it help? If you want to us to investigate the issue further go to tools | diagnostics in the program menu. In the opened windows click send button. The logs will be sent to our support team automatically. This will help us diagnose and troubleshoot the issue. Please DON'T send us the log file attached. The log file will be sent automatically. I have a system with a folder within a bucket for each client. 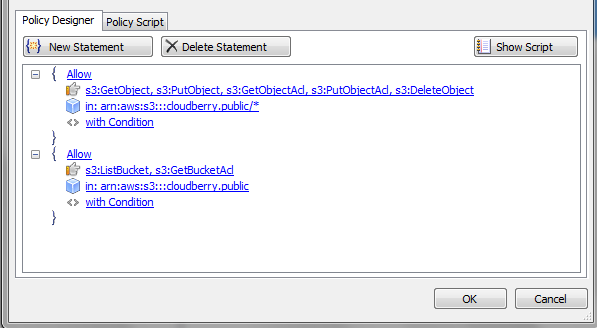 I want to give them an "external bucket" in cloudberry that goes directly to that bucket/folder. I can limit the permissions, but I simply can't have them seeing 500 other folders of other clients. Isn't there a way to make an external bucket/folder rather than just an external bucket? I'm also getting the "Access Denied. You can register pay calls" error message on this. Can anyone please help?